You know something the world could always use? The potential to smell the scent of fries in the air is high in every town in America. Head into our neighborhoods and you aren’t likely to smell that same smell. We buy more fries than we fry. Maybe if we gave up the fast food fry on a three times a week basis and settled into a more homemade fries, twice a month only, lifestyle, I would say we might be healthier as a nation. We would for sure be more satis-fried – not the short lived “healthier” fries that Burger King rolled out. 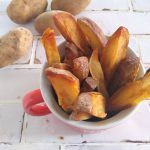 I am happy to say I have come across a fry recipe that would make me yern for that homemade fry life. And they are good eats, reloaded that is. 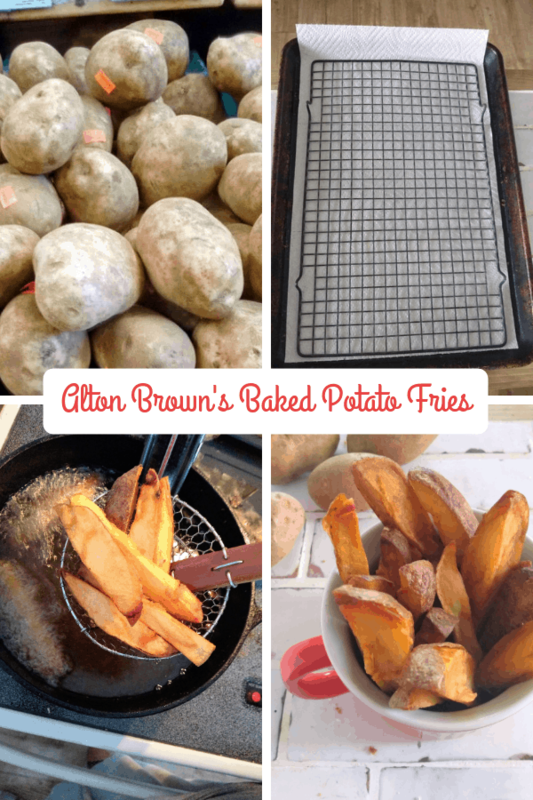 As part of Alton Brown’s series of fixing his past blunders, Alton comes out with a new fry recipe that would take the cake, if only it were cake. 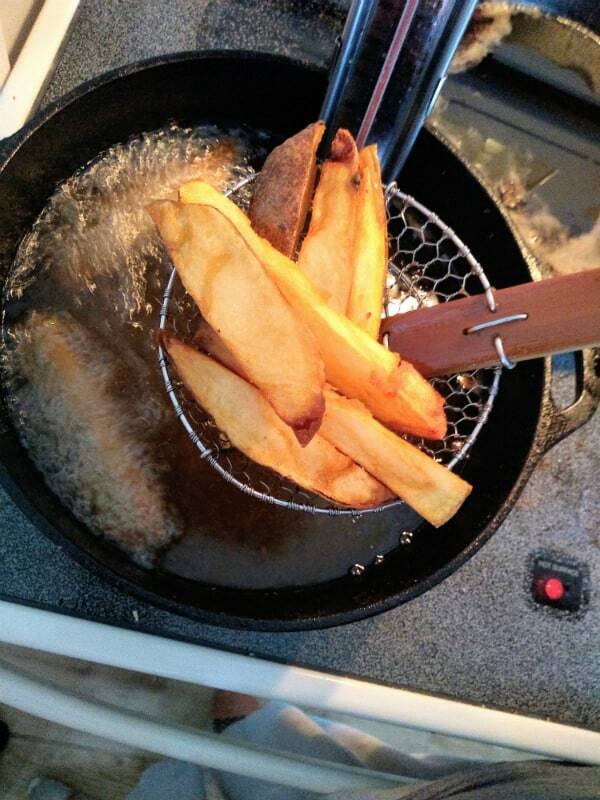 One popular method of making fries to double fry them. That is cook them at one temperature, removed them, and then cook them again at a higher temperature just to crisp the up. It’s not a bad idea, but I think this recipe is easier. As it starts with simply baking the potatoes and allowing them to cool. You can bake up a whole big bag of potatoes, enjoy some with sour cream that night and the next day, fry the leftovers. I learned from Alton years ago that you don’t need to wrap your potatoes in foil like some people do. Neither do you need to cook them on a sheet pan. Just place the potatoes right on the oven rack. Simple as that and save money on foil and water use to clean a sheet pan. Another time saver with this recipe is that you don’t have to peel the potatoes. Leave the skin on it. They look better that way. The challenge we faced with cutting the potatoes and including the skin in each cut is that we had some pieces that ended up being too small or they kind of feel apart, especially near the middle. I wanted uniform fries for even cooking, so we just didn’t use all the potatoes. You can still save those piece for reheating and just eating. These fries are coming fresh out of the hot oil, perfectly crisp outside while staying soft inside. Steak fries are my favorite, so of course I am going to love these fries. Here is the thing, my wife doesn’t love steaks fries as much because they usually aren’t as crispy as thin shoestring fries. Not the case with these fries. That outside is as crisp as it gets. I would argue the only fries I have had that were crispier were actually burned. That crisp exterior is accompanied by a soft inferior. That my friend is what we call the perfect fry. The two part bake-then fry method works so well here. There is no doubt these are the new go-to fries in my home. 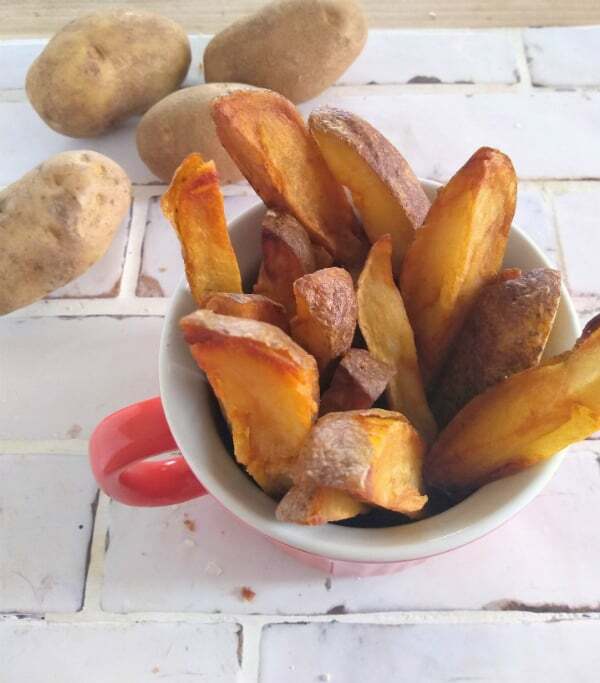 Baked potatoes are turned into the crispy fries with a soft interior. Alton Brown’s recipe. I have listed the instructions in my own words. Bake for 45 minutes to an hour or until the potato can be pierced with a fork. Allow potatoes to cool. Place in the fridge for at least 12 hours. Heat your oil in a cast iron Dutch oven or other heavy bottom pan to 375 degrees. Use a fry/candy thermometer or infrared thermometer to monitor the temperature. While oil is heating, cut the fries to about 1/2 inch thickness leaving the skins on. Important to try and keep the fries as uniform size as possible for even cooking. When oil is ready, fry 8-10 fries at a time until golden brown and crispy about 2-3 minutes. Adjust your heat higher and lower to keep the oil temperature as close to 375 as you can. Remove the fries to a sheet pan lined with paper towl and cooling rack on top. on the pan. Sprinkle with salt to taste right away. Previous Post: « Can You Cook Applesauce in the Instant Pot?